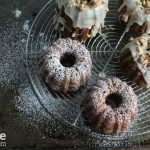 This recipe should make at least 8-9 mini bundt cakes. In a medium bowl, combine the grated carrots and brown sugar. Let sit for about 10-20 minutes, then stir in the raisins. Preheat oven to 375 degrees F. Prep mini bundt cake pan with cooking spray and light flour if desired (knock out excess). In a large bowl, beat eggs until light. Gradually beat in the sugar, oil and vanilla. Stir in the crushed pineapple. Combine the flour, baking soda, salt and cinnamon, then stir into the wet mixture until absorbed. Finally stir in the carrot mixture. Pour evenly into the bundt cake pan. Bake for about 22-25 minutes. Let cool for 10 minutes before inverting and removing from pan. Place finely chopped white chocolate in heatproof bowl. In a heavy saucepan, boil the heavy cream over medium-low heat. Turn off the heat when you start to see small bubbles forming around the edge. Immediately pour the hot cream over the chopped white chocolate. Using a rubber spatula, slowly stir in a circular motion, starting from the center of the bowl, and working out to the sides. Be careful not to add too much air to the ganache. Stir until all of the white chocolate is melted, for about 2 minutes. It may look done after 1 minute of stirring, but keep going to be sure it's emulsified. Let cool slightly. To assemble: Drizzle on the white chocolate ganache and garnish with the chopped walnuts. Alternatively, you can simply omit the ganache and dust on some confectioners sugar.